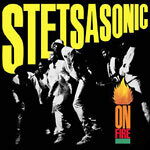 Years before The Roots became a household name, Stetsasonic was already pushing the boundaries of what was considered hip-hop. Formed in 1979, the crew featuring Delite, Daddy-O and Frukwan on vocals, with music from DBC, Prince Paul and Wise turned heads with their vibrant fusion of hip-hop and live instruments. Their 1986 debut album, On Fire, introduced the world to their unique sound: lots of punchy drum breaks and b-boy aesthetics, with upbeat, positive party rhymes. Prince Paul, who would later go on to find success with another Tommy Boy Records act (De La Soul), was already showing a talent for creative productions with tracks like ''Just Say Stet,'' ''On Fire'' and the lead single ''Go Stetsa.'' Frukwan would also join Prince Paul as part of the Gravediggaz in the early 90s. Recognized by The Source magazine as one of the 100 Best Rap Albums ever in 1998 (with ''Go Stetsa'' also named to their list of 100 Best Rap Singles), On Fire is an undisputed hip-hop classic and an essential part of any music fan's CD library.